I think I’ve taken on a traveler’s lifestyle. I don’t overthink anything anymore, in fact I hardly think. I’m in a routine of finding beauty, photographing it and moving on to the next place. It’s a really easy routine! My camp is usually set up within 5minutes of parking and I seldom wonder what to have for dinner or lunch. I rarely eat more than two meals a day and I never go to bed hungry. Am I spoilt back home with 3 meals? Do I need 3 meals a day? I now eat when I’m hungry, and that’s it. Over the past couple of days I have become a bit lazy with my writing but I also became a bit more social. I’m spending time with people, listening to their stories and I don’t say bye until I’ve heard it. From day one to eleven, I never really opened up and talked to people. I think a part of me was unsure of what to answer to simple questions “Why are you traveling alone?” “Why are you taking pictures?” Now, I have answers to all these questions and answer them confidently. My goal is clearer than ever. I am happy with the work I am producing. No, not everything is turning out to be night images as originally planned. Yes, I struggle from time to time to get something, anything worth showing off. Cool thing is, I am finding real gems in South Africa, that not a lot of people ever get to see. Places popping up in my mind now are Riemvasmaak, Pella and Witsand in the Northern Cape. These places are flooded with history and interesting people, with stories that inspires. Annatjie and her Husband Nick live just outside the small town, Pella in a place named Oasis in the Wilderness. It’s a guest farm where they have been living for the past year as Nick is working at the nearby mine as a crane operator. Annatjie and Nick are both in their 70’s, but still going strong. Annatjie tells the story of her being paralyzed for four years after a brutal accident. She lost her memory. She had to relearn to talk, walk, read, write and then came to the realization that she has three children and a husband; a very loving husband. He stood by Annatjie though everything. People, including doctors, told him his wife would never walk or speak again, but he refused to believe it as he believed in Annatjies’ fighting power and strength. Today Annatjie walks, talks and is always busy with something. She still can’t remember what happened before the accident, but she doesn’t take life for granted, ever. Annatjie is a living example of joy and happiness. She told me to always live passionately and live every day to the fullest. In my life, I have never met a more passionate and joyful person. 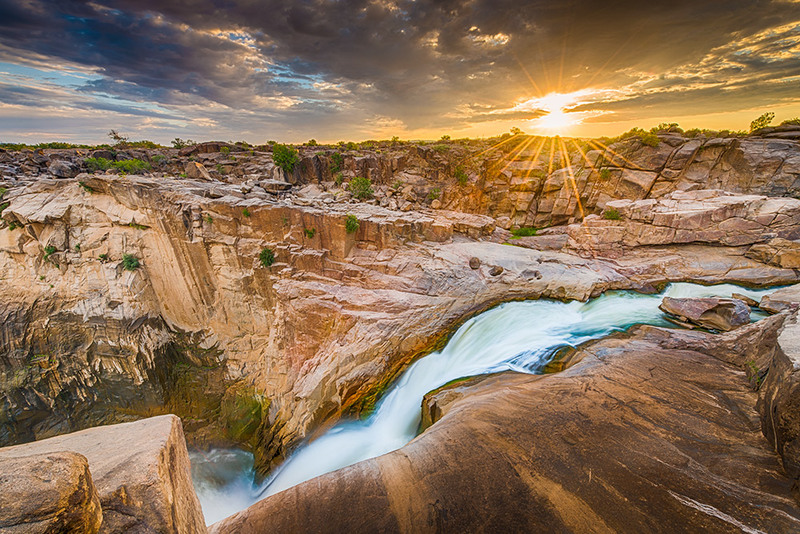 In other news, I am taking on more touristy things, I went out to the Augrabies falls and loved it, below is an image I thought would be pretty cool to share. If you have any questions, comments or suggestions, please let me know. I’d love to hear from you! Route traveled thus far: Port Elizabeth to Steytlerville. Steytlerville to De Rust. De Rust to Matjiesfontein. Matjiefontein to Touwsriver. Touwsriver to Kouebokkeveld. Kouebokkeveld to Citrusdal. Citrusdal to Doringbaai. Doringbaai to Papendorp. Papendorp to Groenriviermond. Groenriviermond to Hondeklipbaai. Hondeklipbaai to Goegap. Goegap to Pella. Pella to Riemvasmaak. Riemvasmaak to Kakamas. Kakamas to Witsand. Tomorrow I’ll be heading for Kathu. Dirk, dit was lekker om jou die naweek te kon ontmoet. Voorspoed met die res van jou toer en met jou loopbaan verder! Jy verdien dit om bekroon te word! Special guy making special memories and extraordinary images …laat die wiele rol!